Registered users who register or who have logged in, benefit from a more personalized and targeted services to their profile, thanks to the combination of the data stored in cookies with personal data used at the time of registration. Such Users expressly authorize the use of this information for these purposes, without prejudice to its right to reject or disable cookies. Cookies, in terms of their stay, can be divided into permanent or session cookies. The first they expire when the user closes the browser. The latter depending expire when the purpose for which they serve (for example, to keep the User identified) or when manually deleted is met. Objects stored in the "shopping cart" in the E-commerce services such as shops. COOKIES GEO-LOCATION: These Cookies are used to find out which country is when a service is requested. This cookie is completely anonymous and is only used to help guide the content of its location. Keeping the user identified so that if you close a service, the browser or the computer and at another time or another day reenters the Service, will continue identified, thus facilitating their navigation without having to identify themselves. This functionality can be deleted if the user presses the function "log" so that this cookie is deleted and the next time you enter the Service User will be logged to be connected. Additionally, some services may use connectors with social networks such as Facebook or Twitter. When the user logs in to a service with a social network credentials, authorizes the social network to keep a persistent cookie that remembers your identity and guarantees access to services until it expires. The user can delete this cookie and revoke access to social networking services through updating your preferences in specific social network. Allow anonymous users identify sailors through the "Cookie" (identifies browsers and devices, not people) and hence the approximate counting the number of visitors and their trend over time. Important: Unless the user decides to register for a service Deco Boho Shop, the "Cookie" will never associated with any personal data that can identify you. These cookies will only be used for statistical purposes to help optimize the user experience on the site. Advertising Cookies: This type of "Cookies" allow more information ads are displayed to the anonymous user in the Services Deco Boho Shop. Among others, the duration or frequency display advertising positions, interacting with them, or browsing patterns and / or behavior of the user and that help shape a profile of advertising interest is stored. Thus, can offer advertising related to the interests of the user. THIRD PARTY ADVERTISING COOKIES: In addition to advertising run by Boho Deco Shop in the Services, Boho Deco Shop can offer its advertisers the option to serve ads through third parties ("Ad-Servers"). Thus, these third parties may store cookies sent from Deco Boho Services Shop from the browsers of users and access data stored in them. All modern browsers allow you to change settings Cookies. These settings normally found in the 'options' or 'preferences' menu of your browser. You can also configure your browser or email manager and install free add-ons to prevent Web bugs are downloaded when you open an email. Some features of the services are disabled, for example, remain identified, keep shopping in the "shopping cart" in e-commerce service, receive information to their location or viewing some videos. 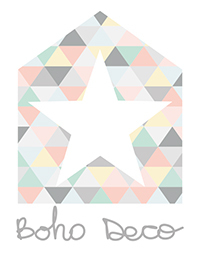 Boho Deco Shop can modify this Policy Cookies in terms of laws, regulations, or in order to adapt the policy to the instructions dictated by the Spanish Data Protection Agency, for it to users who visit regularly are advised legislative requirements. When significant changes in this Policy Cookies, Users can communicate either through the web or through email to registered users.